I was so apathetic this week. I like mushrooms, but it’s extremely rare that I’ll make them the center piece of a meal – or even of their own dish. I think the last time they took center stage was in a dish I made for Thanksgiving last year. I’ve also gone back to school (as in, my school year as a teacher has started up again; not as in, I’m a student again *shudders*). When school starts up, my cooking schedule tends to get tighter. I don’t always have time to run to the grocery store for needed ingredients; I have to pick up the baby from daycare; my husband inevitably calls 5 minutes after I get home and asks when dinner will be ready. So, I just don’t have as much time to work with to get an awesome and interesting dinner on the table. I make a calendar the Friday night before, and Lucy and I hit up the grocery store and farmer’s market the following morning. So with my calendar already made, I didn’t know where I would fit in mushrooms. Tacos with chicken and mushrooms? Nope. Spicy Italian sausage with peppers, onions, and mushrooms? Well, technically it works, but the mushrooms take a back seat to just about every other ingredient in there. Same goes for Friday’s Pizza Night. So I browsed pinterest for inspiration. 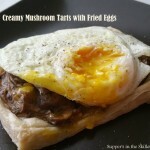 Mushrooms with puff pastry? Check. Make the mushrooms creamy? Sounds delicious. But it’s still not what I want it to be. And then it hit me. What’s possibly the trendiest thing to put on, well, everything, right now? …A fried egg. And an idea was created. Sunday brunch it would be! It was scrumptious, too. Scrumptious…that’s a weird word. But it fits here so well. The puff pastry baked up to be nice and fluffy, and it browned just the perfect amount to have that light crisp to it when bitten into. The mushrooms were creamy and flavorful (sage, basil, and red pepper flakes tend to do that). And the egg… Well, the yolk was delicious, but I over cooked the egg (I timed things wrong. For some reason I thought the egg would take longer to make, but the pastry wasn’t browning as fast as expected). 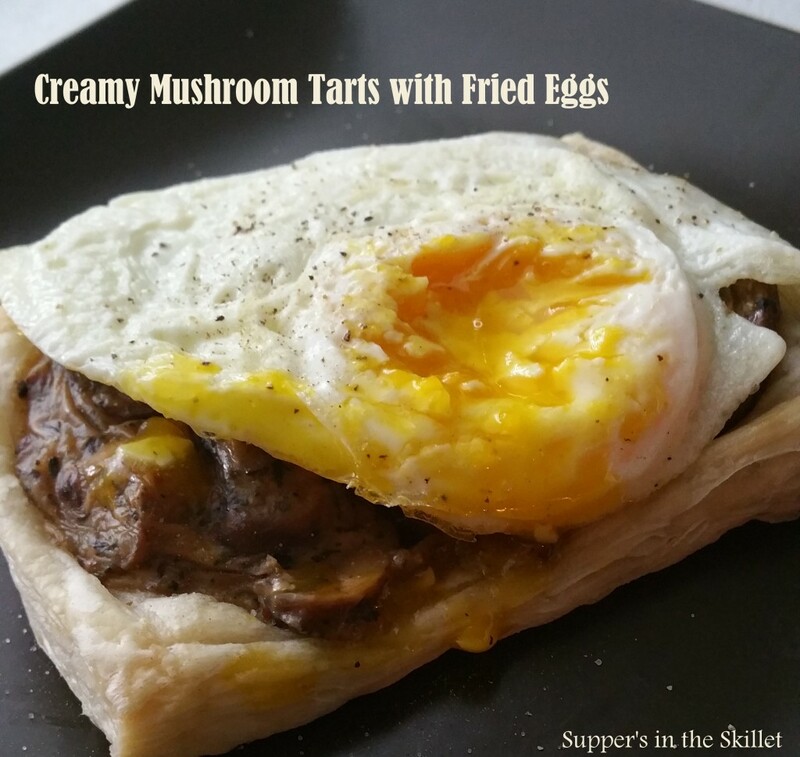 Flavorful, creamy sauteed mushrooms over puff pastry, served with a fried egg on top. Yes, please! 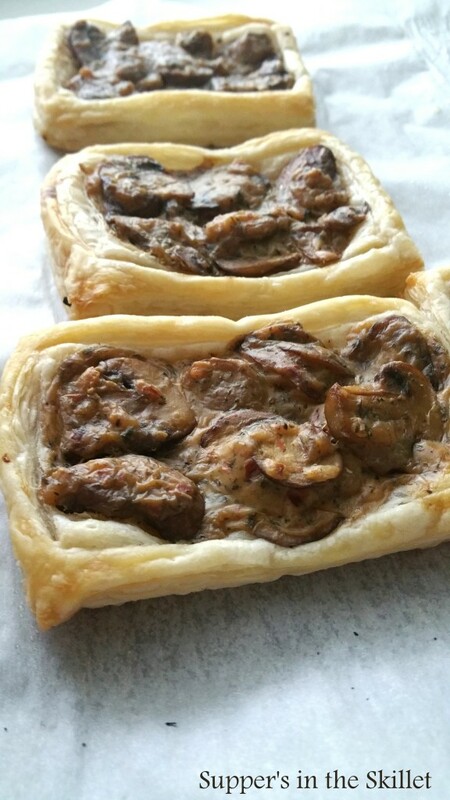 Remove puff pastry from freezer, allow to thaw for 20 minutes. Cut into 6 rectangular pieces, and place on parchment paper-lined baking sheet. Lightly score a border around 1/4 inch from the edges. Use a fork to poke light holes (not through) around the center of the pastry. Brush center with 1/2 tbsp melted butter. While pastry is thawing, preheat oven to 400 degrees Fahrenheit and heat a skillet on the stovetop over medium heat. Once skillet is heated to medium, add 1 tbsp butter. When butter has melted, add garlic and mushrooms. Allow to cook for 5 minutes while stirring occasionally. Slowly pour in milk, 1/4 c at a time. Mix between additions. Once milk is incorporated add sage, basil, and red pepper flakes. Cook, stirring occasionally, until thickened. Remove from heat and place within the scored center of the pastry shells. Place in oven and bake for 20 minutes or until pastry is golden brown. When around 12 minutes remain of cooking time, preheat griddle to medium-high heat. Add 1/2 tbsp butter. When butter is melted, add eggs. Cook eggs until whites are mostly cooked through, but yellow remains soft. Flip; cook 30 seconds. Remove from heat, and add to top of cooked pastry shells.